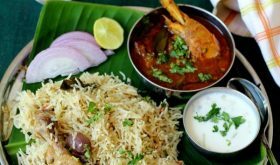 Andhra cuisine has a vast array of brinjal recipes. Today’s Vankaya Nuvvula Masala or brinjal curry is a classic Andhra vegetarian recipe that is prepared on special occasions and can be considered for a party vegetarian menu. Quite a few Andhra vantalu (dishes) call for the use of sesame seeds be it a spiced Nuvvula Podi or a calcium rich Indian sweet like Nuvvula Unda (sweet sesame balls) or a curry like brinjals in sesame sauce. Sesame seeds lend a nutty flavor and body to the dish. 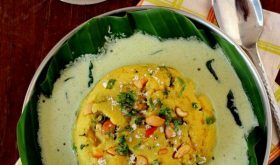 I receive quite a few requests for Andhra Vegetarian recipes and vegan recipes. 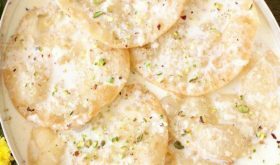 Hopefully I should be able to post more such recipes for the benefit of my readers. Brinjal curry in sesame seeds sauce is a vegan dish that goes well with rice or rotis. 1 Place the brinjal with + quarters and stalks intact in salted water and keep aside for 10 mts. 2 Add 1/2 tbsp of oil in a cooking vessel, add the brinjals and roast them till brown, approx 7-8 mts. Remove and keep aside. 3 In the same vessel, add the green chilies and sliced onions and saute for 4 mts on low to medium flame. Remove and cool. 4 Grind the onions and green chilies to a fine paste. Remove. 5 Grind the lightly roasted khus khus and sesame seeds to a fine paste, adding 2 tbsps water. Remove. 6 Add the remaining oil in the vessel, add cumin seeds and as they splutter add the curry leaves and onion paste. Saute for 3 mts. Add ginger garlic paste and saute for another 3 mts. 7 Add the khus khus paste and cook for 3 mts. Add turmeric pwd, red chili powder, coriander powder, methi powder, cumin powder and salt. Mix. Add 2 cups water and bring to a boil. 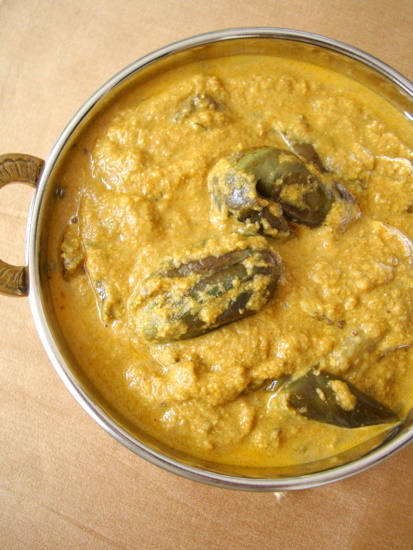 9 Serve Vankaya Nuvvulu Masala or brinjal curry with flavored rice or rice or roti. this curry looks verry yummmy and tempting..
Looks delicious! Your site is a one-stop for us whenever we get brinjals, so many lovely recipes! 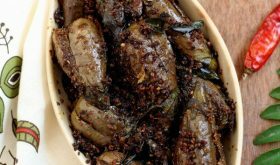 Your brinjal in sesame sauce looks delicious. Thanks so much for stopping by my blog. It was terrific to see you there. Life has been challenging for me lately but I’ve been around. And yes, I still make the plantain dishes, including the one I learned from you. Yum! Have a wonderful week. I hope to be able to visit your blog more often in the near future. Hugs from New York. This is my favorite way to eat brinjal. I have eaten this once at a restaurant here in the States that touted an Andhra chef. It was absolutely delicious. Can’t wait to attempt a replication now that I have the recipe. Thanks! I just tried this curry, it came out a little bitter. Is that the expected taste? I followed the measurements closely, not sure what went wrong. Good quality fresh sesame seeds are essential for this dish. I really enjoyed this recipe, it came out great in the end. I think the key is to have everything prepared beforehand, then it’s quite straight forward. 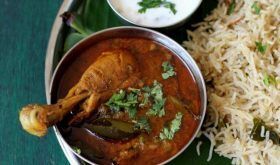 I going to try and make a chicken madras this weekend, I found the recipe here http://chickenmadrasrecipe.com/, I’d be interested to hear your views on it before I begin. Love your collection of recipes.. reminds me of home food. Although Poppy/Khus-khus is great ingredient with enormous flavor, it shows up positive in drug tests. and now-a-days, most companies do random drug testing. Can you suggest any alternative that can bring out equally good flavors?